After reading numerous posts about wiring the brake controller to my new Touareg as well as step by step instructions, I gave up. I can't wire it myself, I would have to find a shop to do it for me. No one in SW Florida. Yesterday I visited my VW dealer. At first he said the parts that I need for wiring are not returnable. After seeing my sad face he said they will accept returns, if unopened, at a 30% restocking fee. Seriously? Then I went to service to speak with the shop foreman. He assured me that my Touareg is not pre-wired for any brake controller and that there is nothing under my dash in a grey foam covering. The service advisor ran some list of PR numbers on my car and informed me that my model's hitch is 1D6. Had it been 1D8, I would have had the pre-wiring. I'm glad they told me this 3 weeks after I bought my Touareg. I bet someone that knows what they are doing could wire it up for you. Check with your local RV dealership (any brand) and see who they use for brake control installs. Try camping world or thst big RV dealership in ft Myers. Maybe they can help either by doing it or giving a reference. Brake controllers are not RV specific. That's too bad. It took me less than an hour to install mine from box to finished. Drove over to a friends house and hooked up his car trailler and it worked like a champ. I could actually see and touch the foam covered connector up through the slot that the brake pedal hangs through. Camping World is not ever a good suggestion. It's last ditch help, if even that. Find us a whole-hearted endorsement, please. And how on earth is one man supposed to be a competitor to a huge national chain? This nanny-ism strains belief. Have a sense of proportion. To the OP: I'd have to wire my own as you have tried. Since the dealer didn't suggest a wiring harness change to accommodate this, then search reports about the wireless controller. I've read at least one, in which the owner was happy. There could be others where problems occurred and modifications made (thinking antenna reception) to ensure best performance. Try to find the most reports here and on other sites. I asked my VW dealer and they seemed clueless(2012 VW Toureg). I ended up driving to London Ontario to have Can Am RV install my Tekonsha because they are the only ones I had confidence in. Have had no problems since! Not a good solution for you but you might want to call them and see if they have any suggestions. They are the towing experts! Red is 12 volts power. Black is ground. 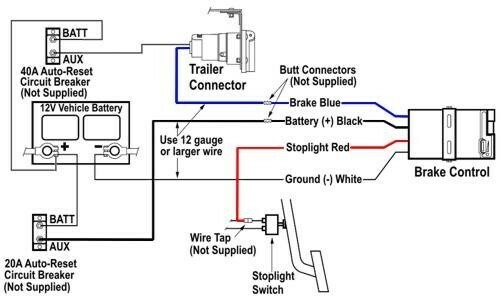 Blue is the brake wire to your trailer harness, white is vehicle brake lights. Any competent automotive mechanic should be able to wire the P3 up using the generic wiring instructions referred to in the installation manual. I looked for them but couldnt find them. An email to Tekonsha should get them for you if you don't still have the ones that came with your unit. I located this diagram online.. very simple stuff. Local independent RV shop installed mine. Local Vee Dub dealer was no help. Bought required parts from a VW dealer in another state...who also provided installation tech bulletin. My Touareg came with towing package including the prewire. It's about elusive as Airstream's solar prewire. I had some problems getting that kind of thing done here in Los Angeles. me to Hitch Depot. They were fast, thorough and very cost effective. We still could not locate the connector so I gave up on the hard wire and went with a Tekonsha RF wireless controller - which would not stay paired until Tekonsha sent an additional part that did the trick! It's an add-on to the 7 pin connector provided by my hitch installer. "7 to 7 Adapter with Resistance: Part #D20142". If you have any questions please contact Tekonsha or Lampert Hitch in Denver, CO. 303.433-8746 and ask for Jason. The universal harness is 4 wires. It is fairly simple to install on most vehicles.